Now available! Purchase online at Amazon.com or Worthy Shorts. This book is about the most profound loss one can experience, the loss of oneself. It is the story of Vittoria who as a child was influenced by her parents’ values. Not felt loved as a child she searches for the ideal relationship, where she can give and receive unconditional love so missed during her childhood. As a young woman she develops her own values, forged by her fresh vision of the world, a desire for a just and loving world and her desire for harmony between races, creeds and social divides. Convinced about the righteousness of her own convictions, as only a young person can be, she adventures in a new world. She emigrates in a new country, meets a man from a different religion and country and she soon finds herself trading her principles for love. She is only 20 he is 28, he is a Muslim she is a catholic, she is educated, he is not. She is open-minded; he is a very conservative man. Strangely though love sips in the relationship blinded by passion, oblivious of contradictions. Her strong desire and need to be loved, accepted and valued, takes precedence over her own desire to evolve and grow. She marries and financial comfort and the allure of possessions distract her from who she was and who she likes to be. She adopts her husband’s values. For a long time she is bribed and blinded by the sparkle of the diamonds. But possessions don’t fill the emptiness she feels. She knows she is going against her purpose, her destiny. She knows she is giving up something very precious, something no diamond can fill. She justifies this ,thinking that she is putting the needs and comforts of the family ahead of her principles and the only way to go on in this charade is to convince herself that she wants the same things her husband wants. It takes a long time before she realizes that by giving up her dreams and values she is disappearing and is metamorphosed into a complete stranger. She realizes that her children deserve to know her and be influenced by her views even if they are in conflict with her husband’s. Events in her life force her to make drastic changes and after loosing something very precious she finally embarks in a journey of the soul. 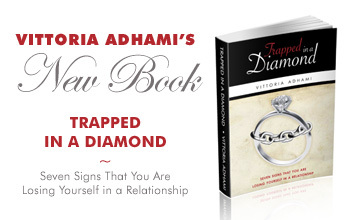 The book is about her journey to reclaim herself and to find the courage to shed any attachment she still has to the shines of the diamonds. She does this to give rebirth to her true self.